A well-timed post from Courtney on the Christmas cakes that are everywhere right now! Ok, I realize that strawberries aren’t exactly special, or even native, to Japanese cuisine. But when winter arrives, I can’t help but think of those perfect strawberries laid out beautifully in their containers. And with strawberries, comes the arrival of Japanese Christmas cake flyers. These flyers are found everywhere from high-end patisseries to local combinis (convenience stores). What’s a Japanese Christmas cake? Is it similar to England’s boozy fruit cake or France’s chocolaty bûche de noël? 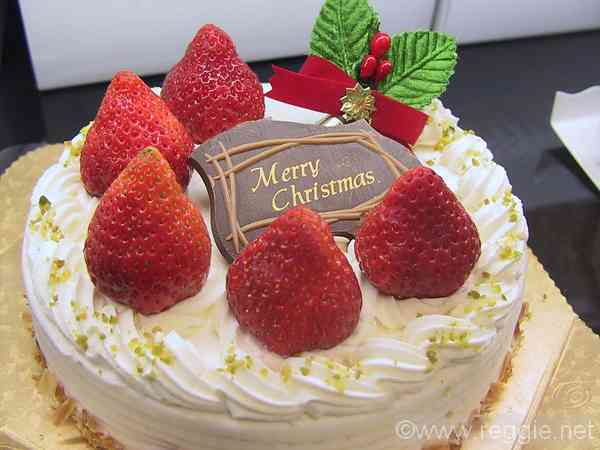 Traditional Japanese Christmas cake is strawberry shortcake which usually gets a wrinkled eyebrow from most westerners, or at least Americans, because it’s typically a summertime treat. The Christmas cake, however, is the perfect melding of Japanese’s love for European treats but tailored to their taste. The light, airy cake is layered with a subtly sweet whipped cream. The real sweetness comes from the strawberries that are layered within and beautiful arranged on top of the cake. Today, Christmas cakes come in all shapes, sizes and flavors with chocolate coming in a close second as a preferred flavor. Most are preordered and picked up after work on Christmas eve. Make a quick stop at KFC Kentucky Fried Chicken for your preordered chicken dinner and you will celebrate this Christmas season the way many Japanese do! I’ve enclosed one of the best Christmas cake recipes I’ve made…and this recipe got a lot of use. I used it to teach a group of 17 homeschool students. If the recipe seems too daunting, check out this video for an entertaining lesson on making a Christmas cake. 1. Preheat the oven to 350 degrees Fahrenheit (170 to 180 degrees Celsius). Line a 7 (18cm) or 8-inch circular cake pan with parchment paper, or grease the cake pan with butter, then lightly coat the pan with flour. 2. Beat egg whites for approximately 3-4 minutes until they become opaque and have some loft. Slowly add sugar as you continue beating the egg whites until they are soft peaks and glossy. 5. Pour the cake batter into the prepared cake pan, and get rid of any air bubbles in the batter by dropping the pan on a counter once or twice. Bake the cake for 25-30 minutes. The cake is done when it is golden brown and springs back when pressed lightly. 6. Cover with wax paper and flip pan onto wire rack. Let the cake cool completely. Run a blade around the inside of the pan to loosen the cake, and remove. 1.In a mixing bowl, combine the whipping cream, sugar, and vanilla and beat until slightly Then whip the mixture at high speed until stiff. 1. Reserve 6 to 10 strawberries for decorating the cake. Slice the remaining strawberries into thin slices (about 4 slices per strawberry). 3. Place one sponge layer cut-side up on a cake board or serving plate and lightly crush the surface with the simple syrup. Spread a thin layer of whipped cream over the cake layer and arrange the strawberry slices over the surface. Spread an additional layer of whipped cream over the strawberries. Brush the cut-side of the second layer with the simple syrup and place it over the first layer. Brush the top with simple syrup. Frost the sides and top of the cake with the remaining whipped cream. Decorate as desired and garnish with the reserved strawberries. 1. Put the 4 teaspoons cold water in a small saucepan. Sprinkle the 1 teaspoon gelatin over the surface of the water and let stand for 5 minutes (do not stir). Place the saucepan over low heat and stir constantly with a wooden spoon just until the gelatin dissolves. Remove the saucepan from the heat and cool to room temperature. 2.In a mixing bowl, combine the whipping cream, sugar, and vanilla (from above recipe) and beat until slightly thickened. Then, while beating slowly, gradually pour the gelatin into the whipped cream mixture. Then whip the mixture at high speed until stiff.